Do you pull dandelions in your yard because you dislike their bright, yellow flowers or because you’d rather not be judged by your neighbors? If you knew dandelions were a food source for pollinators, especially in urban areas, would that change your behavior? Our human tendency to orient to the herd may make us strangely similar to the pine processionary caterpillar. 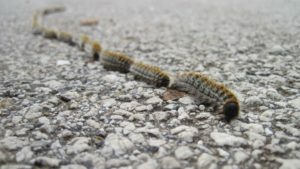 Pine processionary caterpillars follow silk trails between their communal home where they shelter and their feeding areas out in the branches of trees. They normally travel out in the morning and back at night, but French naturalist J. Henri Fabre once observed a group that got caught on a rim where they circled for seven days straight. “None abandoned their evolved behavior pattern, where the others, and not the biologically relevant environment, had become the reference (Heinrich, 2014).” Homing to the group, rather than the surrounding environment meant the end for the Rocky Mountain grasshopper, passenger pigeon, the Eskimo curlew and the Carolina parakeet. All aggregated to an extreme extent where their behavior was informed by each other rather than by a place. Humans are also social creatures where banding together has allowed us to prosper and become the dominant feature of the landscape, even in places ill suited to meet human needs. When our connection to each other becomes more important than our connection to the environment we risk missing important signs of environmental stress that could signal a change in behavior is needed. Learning to read, respond and vary our reference points may increase the odds that someone will survive the circular death march of group think. Inspired by a chapter of the book, “The Homing Instinct” by Bernd Heinrich, 2014 (p 285).